Generators are loud, noisy and smelly! Plus, it can be expensive to use gas generators, which send emission fumes spewing into our atmosphere. October 2, 2015—-A market for solarizing the RV (Recreational Vehicle) is currently growing, as more people are becoming full time RVers and spending winters in desert communities without hookups or on mountain peaks in the national forests (Boondocking). 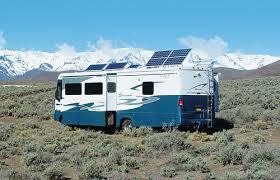 Why go solar with your RV? Generators are loud, noisy and smelly! Plus, it can be expensive to use gas generators, which send emission fumes spewing into our atmosphere. Solar is clean, requiring little maintenance, and it’s possible that it can pay for itself in the long run if you’re a full timer. Today, most solar panels for RV’s are laid on the roof and are unable to track the sun, but are more convenient than moving the panels around during the day to face the sun, as we did with our Scamp system. Also, regular solar panels mounted on top of an RV will lose voltage as they heat up, with temperatures above 77 degrees. So panels should be high voltage panels and mounted with space underneath to allow air to flow. Boondocking and relying on the sun’s energy may require you to conserve electricity, as most RVs have a limited amount of battery storage, although in the future this most likely won’t be an issue. More efficient appliances might also help to conserve electricity when boondocking. I have a friend who built a swamp cooler for his RV. And, it works well in a semi-desert environment like Colorado. And, to go one step further, how about setting it up as a solar swamp cooler? (See website below for details). You can design your own method of solar! 1. local.thesolarguide.com/RV_Solar Kits– Gives local resources in AZ that will provide advice, businesses that deal in rv solar and solar kits. 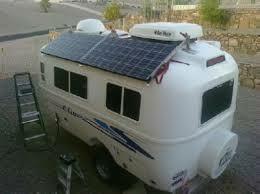 2. handybobsolar.wordpress.com– From this website you can access many links on solar rvs and descriptions of the sites. 3. jackdanmayer.com-This site is by a couple who are full time RVers. Among other information the site has a section on RV Electrical/Solar, in which they describe “various wiring techniques and electrical designs which conform to the electrical code.” If you want to hire an installer they recommend AM Solar (Greg Holder) in Springfield, OR, Palmer Energy in Florida, D&R Family RV, in Glendale, AZ or Starlight Solar in Yuma, AZ. 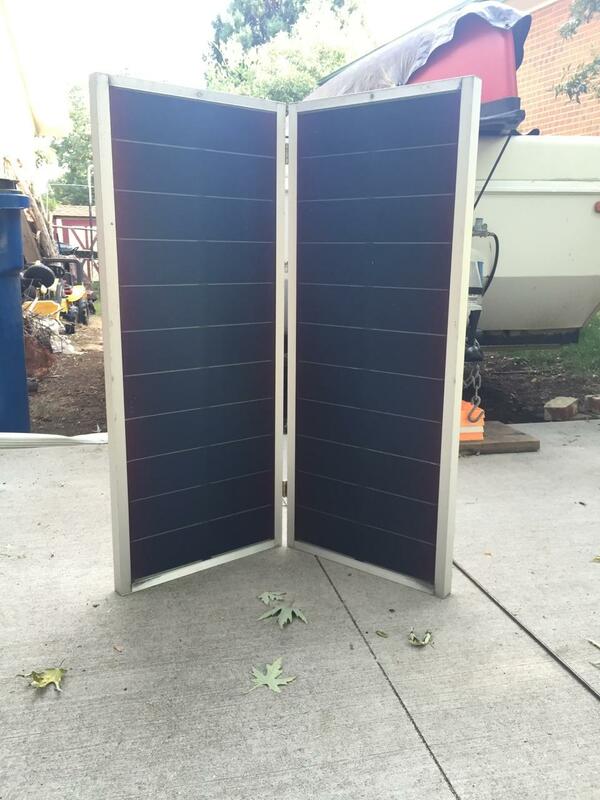 4. builditsolar.com-on this site you can download directions for not only building a swamp cooler for your rv, but also turning it into solar. 5. gonewiththewynns.com-with help from their Solar Guru they give you an idea of the perfect solar setup for 3 types of RVers: Basic, Medium and Heavy use. Home Depot, also, has most of what you would need to convert your RV to solar. You can order these parts at homedepot.com: solar panels, chargers, inverters, amp charge controller, battery or everything in a kit. So, if you have an RV, or pop-up, and you’re thinking about a cleaner, greener environment, I hope this will give you some ideas. Working for a cleaner planet! Categories: Building Green, Fossil Fuels, Pollution, Renewable Resources, Sustainable Education | Permalink.